HomeWeb Development It’s Time for Your Routine SEO Maintenance Appointment! It’s Time for Your Routine SEO Maintenance Appointment! Now more than ever, the art of marketing is becoming more and more specialized as we shift more towards all things digital. Gone are the days where you only needed a shiny new website and social media to be successful. It’s time to take a look under the hood and see how your Search Engine Optimization (SEO) is performing. Think of SEO as the engine of a car. It propels the entire vehicle (your business) forward with the help of social media, your website and your product (the oil and gas) in addition to the website copy (the tires). For your vehicle to operate successfully, it needs every single part to work. Sure, your car will still operate OK with low tire pressure or low oil, just like your business will be OK with lackluster website copy, but we’re pretty sure you don’t want your business to be just OK! We’re assuming you’ve used Google. It’s 2018 – who hasn’t? You type in a few keywords, hit enter and then Google’s magical elves somehow find everything you could possibly be looking for. All because of the elves – and the keywords, of course. When yielding search results, Google will first display business ads (#capitalism), and then the webpages that best fit the keywords used in the search. Google finds these pages by crawling every single website on the internet (yes, ALL of them!) for the keywords entered in the search field. So, much like the make and model of your car determines the type tires you need, your business and industry will decide which keywords you should use to stay competitive. When you get to the (organic) business pages, you will see Christie’s International Real Estate listed first, followed by our friends at Silver Leaf. Now, look at the bolded words. They all match the keywords in the original search. How will this make my business money? 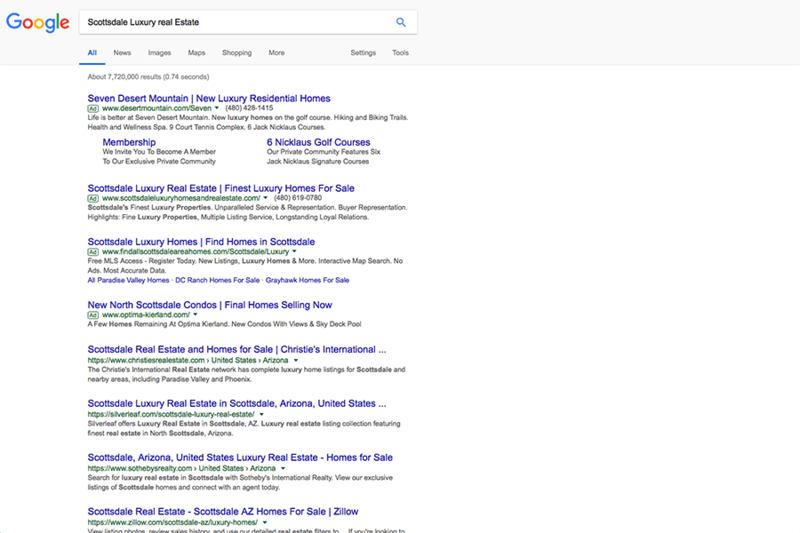 “Scottsdale Luxury Real Estate” yielded 22,100,00 results. Odds are that neither you nor your customers are going to look through every single result. Realistically, you’re going to go through the first two pages at best (any more than that and you’ll probably be shunned from society). In fact, a recent study showed that 60% of clicks go to the top three websites in search engine results. SEO is extremely important if you want those searches to convert to your website. SEO isn’t an infomercial from 2005. You don’t just set it and forget it. If your customers can’t find you on Google, you might as well abandon ship. It’s also nice to getting intuitive feedback from Google Analytics so you can have an understating of your SEO performance. Guys, this one’s a no-brainer. You can include the keywords in each blog post (kind of like what we’re currently doing – wait, what?). This will help you rank higher in Google search results – the #1 goal! We know this doesn’t seem like a lot, but it can make a world of difference. Review your website copy every six months in tandem with the SEO data and make changes as needed. This will help you stay ahead of your competition. Just set a calendar reminder so you won’t forget! We know the digital marketing world is complicated, but Decibel Blue can be your friendly neighborhood marketing and PR agency, helping you #SoundLoud. Diane is the President and Founder of Decibel Blue. She actively participates in philanthropic initiatives and is a former board member for the Juvenile Diabetes Research Foundation’s Rocky Mountain Chapter and Phoenix Suns Charities 88. She currently volunteers with the Colorado Women’s Chamber of Commerce and Denver BASICS, where she serves as a business coach. She holds a Bachelor of Arts Degree from Scripps College in Claremont, California. In her spare time, she enjoys travel, playing with her circus dogs, biking, and learning all there is to know about Airstreams.